The support of individuals and businesses is an important part of our existence. 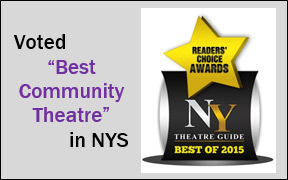 Your partnership enables us to continue the tradition of quality live theater in our community. Home Made Theater has been very fortunate over the years to have the continuing support of the community. This includes support from more than 200 volunteers who donate their time annually, thousands of audience members who see our productions per season and our individual and corporate sponsors who offer financial support.